Adelaide Scanning are able to offer digital archiving for all your business records. 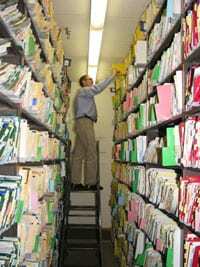 For statutory reasons many businesses are required to keep records for more than seven years. But where do you store all these business records? Off site storage facilities require upfront fees, often are expensive, and should you have to retrieve these documents or schedule a destruction of records, additional costs arise. Instead consider archiving your business records into a digital format saved on a read only DVD.